One of a new generation of young British explorers, Tom Avery is a high achiever in the field of polar adventure. He was the youngest Briton to walk to both the south and north geographic poles – a feat that has only ever been achieved by 41 people. The Guinness Book of Records recognises the second leg of this achievement as ‘the fastest surface journey to the North Pole’. But this was no ordinary sprint. 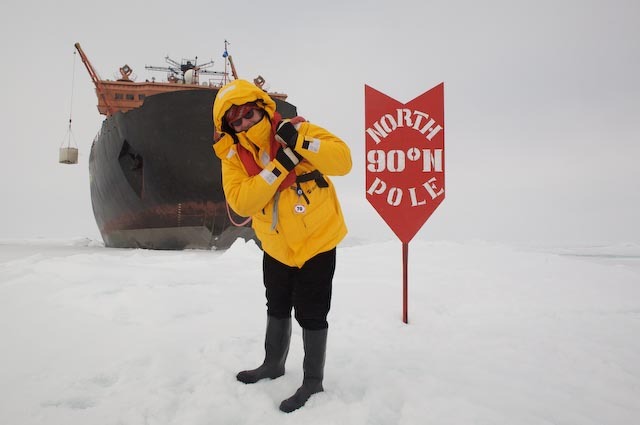 Avery’s 2005 Barclays Capital Ultimate North Expedition set out to retrace Robert Peary’s polar epic of 1909 in an attempt to ground-truth the American’s often disputed claim to have reached the pole in 37 days. In beating the US Naval Commander with merely hours to spare, it was a trip that was to propel Avery – then in his twenties – into the media limelight as one of an exciting new breed of ice adventurer. Tom Avery’s To the End of the Earth is his account of his controversial expedition as well as an analysis of the historical record that means the names Peary, Herbert and now Avery will always be linked to the place veteran UK polar explorer Pen Hadow called a ‘pinprick of nothingness in the middle of nowhere’. Its publication coincides with the centenary of Robert Peary’s ‘discovery’ of the North Pole on 6th April 1909. Explorers Journal: What were the objectives of your Ultimate North expedition? Tom Avery: The plan was to recreate Peary’s journey as closely as possible. You can never do it exactly – that’s impossible. But we said: ‘let’s do it – let’s go from Cape Columbia to the Pole in 37 days.’ It seemed to me that the controversy over whether Peary had got to the pole centered around his travel speeds. There were questions about his navigation and omissions in his journal, but the main crux of the argument was his speed. He’d started off at a fairly moderate pace and rapidly increased towards the end. In his book The Noose of Laurels Wally Herbert said that these daily distances were physically impossible on the polar pack. That was something I was very keen to test. EJ: How is that possible, with the ice conditions as they are today? TA: The Arctic Ocean of 2005 and of 1909 are two completely different playing fields. There is far more open water now and the ice pack is thinner, so when pressure ridges form they are actually smaller than in Peary’s day. But they are more numerous and less stable. So in some respects it’s harder to make the journey today. We said that if we could do this then we would demonstrate to Peary’s detractors that his speeds were in fact reasonable. EJ: You weren’t trying to prove the Peary had got to the pole? TA: No. It is impossible to prove whether Peary and Henson and the Inuit men reached the pole. When Amundsen reached the South Pole and left his tent there, so when Scott arrived 35 days later, it was all too obvious he’d been beaten. But if you look at Amundsen’s travel speed, had Scott not seen the evidence of Amundsen’s success, it wouldn’t surprise me if some would now doubt the Norwegian’s claim. Even if you could find the glass bottle that Peary left at the Pole you could always argue that it had been left a hundred miles away and it had simply drifted there on the ice. EJ: Do you think Peary got to the North Pole on 6th April 1909? TA: All you can do is look at the available evidence and make your own decision. But I believe, having travelled in the same style in slightly faster time, that he got there. Without GPS you can only be certain to a point, of course. When Wally Herbert got to the Pole in 1969 he got to within a mile using the instrumentation he had, set up camp and then boxed it. If Peary got within a couple of miles, then that’s good enough for me. EJ: What about the trip itself? What’s it like travelling with dogs? TA: It’s the most exciting, bonding experience I’ve ever experienced on an expedition – we got so close to those animals. We started off a team of 5 people and 16 dogs, but we very quickly became a unit of 21. I probably talked to the dogs far more than my fellow teammates. What they are capable of is awesome. Those animals are at their happiest when they are pulling a 50 stone sled across ice and snow. You wake up in the mornings and they are jumping and barking and wagging their tails and that is all they want to do. Sure towards the end of the day they get pretty grouchy when they’ve had enough. I formed a very close bond with one dog called Ootah named after one of Peary’s Inuit, who was the strongest dog on the team, but for some reason wasn’t very popular with the other dogs. EJ: What happened to Ootah? TA: He fell ill and couldn’t pull his weight along with the others. This actually caused the biggest disagreement we had as a team. Some of us were saying ‘he’s not going to make it, let’s replace him’, but I felt very strongly that we should finish the expedition with the same dogs we started off with if possible, and I wanted to nurse him through it if we could. Peary didn’t have the benefit of being able to fly in extra dogs and so why should we? Anyway, Ootah pulled through and he made it to the pole. TA: The storm blew up pretty quickly and it came about through Wally Herbert –probably the UK’s greatest ice traveller since the days of Scott and Shackleton – who tried to pour cold water on our expedition. I said that based on what we’d achieved Peary’s travel speeds seemed reasonable to me, and that I though that Peary had reached the pole. You’ll never be able to prove it, and some people may disagree, but this is what I think. Sir Wally took this very personally and launched a campaign within the exploration community in the UK to discredit my team’s expedition. EJ: Do you think Herbert was simply mistaken in claiming he was the first there? TA: In The Noose of Laurels Sir Wally says some nice things about Peary and how much admiration he has for him. He then analyses Peary’s expedition in minute detail and completely discredits him. He doesn’t actually say the words ‘Peary cheated’, but that is the conclusion the reader draws. We were a bit hurt and insulted about some of the allegations Sir Wally came up with – for example he said that because we’d only spent 37 days on the ice compared with his 400-plus, we were in no position to comment on Peary’s expedition, which is nonsense. EJ: What do you think Sir Wally would have made of your new book? TA: I think it’s incredibly sad that Sir Wally is no longer with us, but if he were I think he’d go through this book with a fine-toothed comb and come up with all sorts of arguments about what we had and hadn’t done on the 2005 expedition. That would have been not bad thing because it would have been nice to have an argument about the facts as opposed to my motives, as was the case three years ago. EJ: What next for Tom Avery? TA: For me, 2009 is all about telling the world about Peary and Henson’s remarkable journey a century ago. I’m going to be spending a lot of the time in the US, lecturing around the country, including at the Explorers Club. The highlight of the North Pole centenary celebrations takes place on the morning of April 6th at Arlington National Cemetery where I have been working closely with the US Navy to organise a big military ceremony in Peary and Henson’s honour at their gravesites. The presidents of both the Explorers Club and the National Geographic Society will be there, along with members of Peary and Henson’s families, my North Pole team, plus a host of other dignitaries. It’s going to be a very special, emotional, goose-bumper of an occasion.